I'm terrible about new year's resolutions, particularly when they're broad things like "get healthier." I do much better nibbling away at big projects in small ways. Rearrange a room? Nah. But I could start with a bookshelf and end up with the whole room re-done and pretty soon I'm in the next room, too. Like everyone else, I know I could eat healthier, but I'm not ready to remodel my entire lifestyle. I'm pretty happy with most of what I eat. I love vegetables. I don't eat tons of sweets. But I could do better. A little here, a little there, and I could be eating a lot healthier by the end of the year. My first nibble is pretty simple. I bake pretty much all of our bread, and when I'm lazy I reach for the bread flour and make my basic white bread recipe. 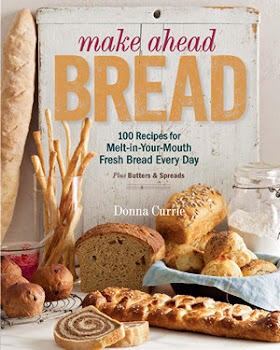 A simple way to make that bread healthier is to add some whole grains. And the easiest way to do that is to use white wheat flour. It can easily be substituted for white flour with not a lot of other alterations, and the flavor is mild enough that whole wheat skeptics don't mind eating it. Since I publish so many of my baking recipes, I try to use ingredients that are readily available (unless I'm introducing something new and exciting). A year or so ago, white wheat flour was a specialty product. I used it a few times, but in most of my bread, cookies, and muffins, I reverted back to white flour. I want to give people recipes they can use. But now, white wheat flour is available at just about every grocery store I shop at. There are several major brands that sell it, and I've even seen a store-brand version, so there's a good chance most people will be able to find it. Adding it to bread recipes, cookies, muffins, and other recipes makes a lot more sense now than it did a year ago. This bread recipe uses barley malt syrup for the sweetener. It adds a deep, rich flavor, but if you don't have it, you could use honey or agave instead. The creme fraiche adds a little tang. You could easily substitute sour cream or yogurt. Buttermilk would work, too, but you might need to add a touch more flour since buttermilk is thinner. I made this bread into a braid, but you could shape it any way you like. Put the water, yeast, and barley syrup in the bowl of your stand mixer. Let it stand while you gather the rest of the ingredients. Add the flours, salt, and creme fraiche. Knead with the dough hook until the mixture is smooth, shiny and elastic. Flour your work surface and like a baking sheet with parchment paper (or sprinkle with cornmeal, if you prefer). Turn the dough out onto your floured surface and knead briefly, then divide the dough into three equal pieces. Roll each piece into a rope about 16 inches long. Pinch the three strands together at one end and braid the strands. Pinch the strands at the end of the braid. Place the braid on the prepared baking sheet and turn the pinched ends under to loaf to hide them and arrange the loaf so it's straight and even. Cover the dough with plastic wrap. Preheat the oven to 350 degrees. When the dough has doubled in size - about 25 minutes, uncover it. Brush it with the eggwash, if desired. Bake at 350 degrees until the bread is nicely browned, about 25 minutes.